October 10th was world mental health day, it got me thinking about my own mental health and one of the greatest challenges to it - my job. I suspect I know what people think my working day is like because when I started out I thought exactly the same: me in a lovely but messy studio at an easel, forgotten sandwich sitting forlorn on the side, clothes covered in paint, sketches all over the floor and half finished canvasses stacked up in the corner. I’d paint the odd picture when the mood was upon me and promptly sell it to a customer who would materialise at my door with a massive wad of cash. Firstly, my studio is a not so lovely shed and I’d never leave a forgotten sandwich anywhere in it – I never forget to eat. Secondly, like anyone running their own business (because that I explain to people is what I am doing) I spend a good portion of every day doing things I don’t love. I rarely spend more than a couple of hours a day in my studio, hardly ever have a day off and I’m never happy with my business performance because I’m not actually very good at running a business, it was never what I set out to do. People are genuinely disappointed when I tell them that, imagine how I feel. It’s hard stifling the creative part of myself so I can focus on “Admin” but I do it because I love creating and because the stacks of admin do occasionally bring a customer to my door (I haven’t yet had a customer materialise by magic) I have learned to cope with having to do the admin. What I struggle with, what I suspect many small business owners struggle with is doing all the admin, all the jobs that a need doing, alone. Some days it gets to midday and other than a cursory exchange with a teenager as they leave for college I haven’t spoken a word to anyone. If the teenagers go out after college I can go all day without having a conversation. When you work for yourself, by yourself there is no one to have a chat with in the office. If a project isn’t going how you’d planned there is no one to talk it through with, no one to share the worry with, understand your problem or make suggestions of how to fix it – when you work for yourself there is just you. This is where coffee and cake and for me my arty friends can all help. Every Monday I take myself to a local coffee shop for an hour long planning meeting. I used to think this was a luxury, its not, it’s a necessity, a change of scenery a positive start to my working week. I go alone, I think, plan, drink coffee, watch the mums with their pre schoolers, think smug thoughts that I no longer have pre schoolers and then head off back home to work. Sometimes if the week isn’t going as well as I’d like I have a Wednesday, Thursday or Friday coffee meeting as well – this one usually involves cake. Getting away from where I work, taking time out from admin and creating, it allows me space to think and to take a few deep breaths. At least once every two weeks I meet up with creative friends – not just because we all love coffee and are great at procrastinating but because we get each other. We make plans and when we meet up a few weeks later we check in on those plans, hold each other to account. We understand if nothing has happened creatively (sometimes it just doesn’t and that alone can be depressing) we “get” the creative stuff and we push the business stuff. We share tips, encourage each other, book art shows together so we don’t have to go it alone; we bully, cajole and nudge each other and generally the job – what ever it is gets done. Learning how to cope with the “Aloneness” of working alone is hard. 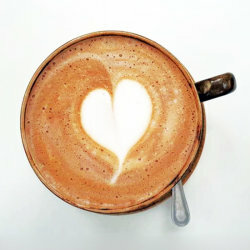 Coffee meetings help, meeting up with arty friends really helps, going to a yoga class with someone, walking, maybe doing lunch… something, everyday just for an hour or so to break the silence and monotony, it can all really help. Scarily not going out, not meeting friends, not going for coffee can all so often become the safest option for someone who works alone. I am determined not to take the safest option. I’m quite determined to do the yoga and walking thing as well - I just need to do the finding the time bit first. By telling you about this I am making myself accountable to you, feel free to ask me if I’ve got the ball rolling yet: bully, cajole, nudge me whenever you want, send me details of a yoga class or suggest a nice place to walk and let me know if you have any tips on how to cope with working alone. Have a question or comment on my blog? let me know about it.